The Sitemaps page displays details based on content-type. Now Statistics from Web, Videos, Images and News are featured prominently. This lets you see how many items of each type were submitted (if any), and for some content types, we also show how many items have been indexed. With these enhancements, the new Sitemaps page replaces the Video Sitemaps Labs feature, which will be retired. Another Improvement is the Ability to Test a Sitemap. Unlike an actual submission, testing does not submit your Sitemap to Google as it only checks it for errors. Testing requires a live fetch by Googlebot and usually takes a few seconds to complete. Note that the initial testing is not exhaustive and may not detect all issues; for example, errors that can only be identified once the URLs are downloaded are not be caught by the test. 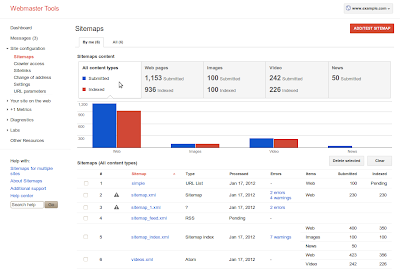 For more information on Sitemaps in Webmaster Tools and how Sitemaps work, visit http://googlewebmastercentral.blogspot.com. If you have any questions, go to Webmaster Help Forum.